Does your cat hate drinking from their water bowl? First of all, cats have naturally low thirst drives. Their wild ancestors lived in arid environments. Water was scarce, so they had to get their hydration from moisture-rich raw prey instead. 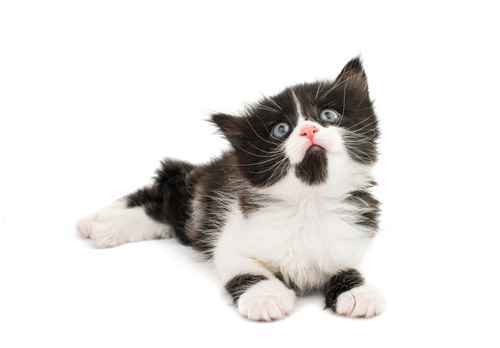 While the typical feline living situation has changed, your cat’s biological needs are essentially the same. Modern cats don’t like to drink water and prefer to get hydrated through moisture-rich food. Secondly, their water bowl can resemble a puddle of stale water. Again, we have to look back at your cat’s wild heritage. In nature, still water is a breeding ground for parasites and bacteria. While it’s not completely safe, moving water tends to be a bit cleaner. 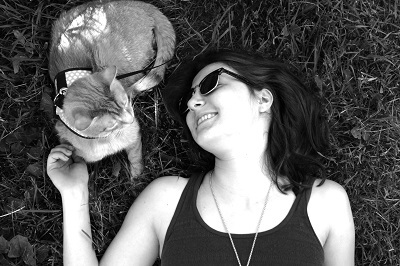 Your cat knows that and is naturally drawn towards freshly-aerated water – like the water in a fountain. Today’s cats have a chronic dehydration problem. While their ancestors barely drank water and consumed prey that was about 70% water, modern cats barely drink water and eat kibble that’s just 6-10% water. While chronically dehydrated cats might look healthy, their low-moisture diets lead to serious problems down the road – like feline lower urinary tract disease and renal failure. A water fountain helps keep your cat healthy and hydrated. Before we discuss how a water fountain can make your cat’s life better, there’s something you need to know. A water fountain is not the final answer to your cat’s hydration problem. While providing a fountain may encourage your cat to drink more and might even keep them hydrated, feeding them canned, homemade, or raw food is the only way to ensure your cat is getting the water they need. Yes, it’s harshly stated – but this is the harsh truth about dry cat food. Cats on a moisture-rich diet typically drink less water and are better hydrated than their dry-fed counterparts. And they’re far less likely to develop urinary tract disease, including the excruciating urethral obstruction that Ms. Pierson talks about in the above quote. My recommendation is to do both. 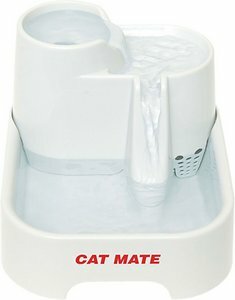 Choose a great water fountain and feed your cat moist food. 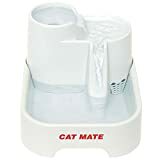 If you need to feed your cat dry food, they’ll have fresh running water to drink.A cat water fountain fountain gets rid of impurities, freshens water, and offers up the active, aerated water source that cats instinctively gravitate towards. Besides the benefit of less worry over feline health concerns, water fountains benefit the human members of the household, too. The babbling and gentle splashing of the water is soothing and adds natural movement to any space. Let’s take a look at what separates the good fountains from the bad ones. Are sturdy. Your cat shouldn’t be able to knock over the fountain and spill water on the floor. Are hygienic and easy to clean. Stainless steel and ceramic are the cleanest materials for water fountains. Look for fountains that are dishwasher-safe. Have a built-in filtration system that ensures the water is fresh and odor-free. This is critical – it’s the key to making your cat love drinking their water! Feature a prefilter. A prefilter keeps hair and debris out of the pump. This component is just as important as the carbon filter. It helps the fountain to run smoothly. Can carry large amounts of water. If your fountain is too small, you’ll need to refill it regularly. It’s better to choose a big fountain that will stay full for long periods of time. Aren’t noisy. Cats have sensitive hearing and don’t like a fountain that makes a loud motor noise. Some cats and people might not like the splashing noise of the water, either. Don’t splash water on the floor. Shouldn’t this go without saying? Appeal to your cat. Some cats prefer gently bubbling water, while other cats prefer a free-falling stream. Observe your cat to determine what type of fountain they might like. If they like to catch water as it flows from the tap, they may prefer a free-falling stream. Cats who drink from the toilet might prefer a fountain that lightly bubbles. Whether your cat likes a softly bubbling cascade or a free-falling stream, it shouldn’t be difficult to find a water fountain that fits into your family. The following fountains were chosen based on their reliability, reputation for being cat-friendly, hygiene, and design excellence. What makes this fountain special? 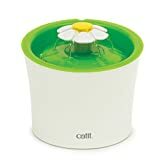 The standout feature on this water fountain is its adorable and practical flower design: the adjustable flower cap allows you to change the flow settings to suit different cat preferences. The fountain can create free-falling streams, gentle bubbles, or calm streams. This is useful if you have a multiple cat home, a finicky cat, or just like to create variety. 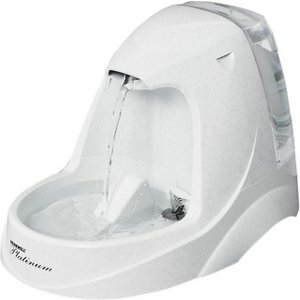 The fountain is made from BPA-free plastic, which is less hygienic than stainless steel or ceramic. It has a 100 oz water capacity, meaning you won’t have to refill too often. Despite its large capacity, this fountain doesn’t take up much space and is ergonomically designed to encourage a healthy drinking position. It features both a filter to keep the water fresh and a prefilter that captures hair and debris before they can get into the pump. This elegantly-designed stainless steel water fountain offers a gently bubbling flow that slides like a lazy river along multiple curved surfaces. Besides being a naturally hygienic surface, the stainless steel is dishwasher safe, making it easy to clean. To eliminate odors and bad tastes, the fountain features an activated carbon filter. However, it lacks a foam filter to keep out hair and debris. This means that the pump could get clogged. The fountain is on the small side with a 60 oz capacity. If you prefer a larger fountain, Pioneer Pet offers another raindrop-shaped fountain with a 96 oz capacity, but it’s not made from stainless steel. Here’s a design-conscious fountain that combines simplicity and beauty with functionality. 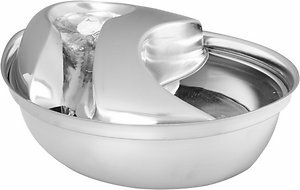 The water fountain has an upper and lower dish, giving your cat three different drinking areas. Water softly bubbles from the very top of the dish, then flows in two streams down into the larger base dish. To keep the water fresh, it has an activated carbon filter paired with a foam prefilter that captures hair and debris. The ceramic fountain is dishwasher safe and hygienic. Cementing this fountain’s status as an attractive addition to the home is its two color options: you can choose either a red fountain or a white one. It has a 70 oz water capacity – about mid-range. This one is a classic: it has over 8,500 reviews on Amazon and is consistently ranked as one of the best water fountains you can buy. It scores points with its adjustable flow control and the appeal of free-flowing water. Cats who love to drink from a running tap will appreciate the free falling stream and others will prefer to drink from the lower basin. The water fountain has a huge 168 oz water capacity, allowing you to use it for long periods of time without refilling. It features a carbon filter to remove unwanted tastes and odors from the water and keep it fresh. This water fountain is made from BPA-free plastic – less hygienic than its stainless steel or ceramic counterparts. It’s safe to wash it in the dishwasher on the top shelf. This water fountain is one of the more affordable choices on this list. It has a square design with several different levels and drinking stations. Water cascades down from the top bowl into a second level, then tumbles down a ramp into the bottom basin. The ramp reduces splashing and reduces water noise. It’s easy to adjust the flow of the water for a customized drinking experience. It contains a carbon filter to purify the water, but it doesn’t appear that this fountain contains a prefilter to keep out hair and debris. The pump may become clogged and malfunction. 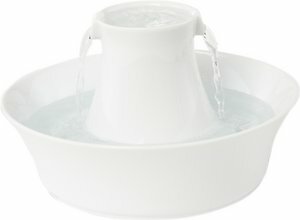 The fountain is made from BPA-free plastic that is dishwasher safe and easy to clean. The fountain has a moderate 70 oz water capacity.